The Treo 650 replaces my old Ericsson T18s. Ericsson no longer produce batteries for it (or at least they aren't available here any longer) and when I recently bought a new third-party battery that went from full to flat in the space of less than a (admittedly, very long) phone call, it was time to look for a new phone. In early 2004 I'd got into some Palm development and had bought a Palm IIIxe through ebay for testing. At the time I was still firmly a Psion/EPOC person. However, with the demise of Psion I started looking elsewhere. I'd also become tired of my phone not being able to carry all my contact details. Plus I'd either be carrying two devices, or I'd have just the phone and no access to my diary, to-do lists or memos, etc. So when my phone died, a smartphone seemed the obvious choice. Windows CE never appealed to me. The idea of using the design of an operating system originally intended for the desktop just wasn't right. Both Psion and Palm got things around the right way by designing for the handheld platform right from the start. The thing I really liked about the Palm was the HotSync. The ease with which your PC and Palm can be synchronized with data and applications was amazing after my Psions. When 4GB SD flash cards became available, I simply had to have one! Digitized maps for PathAway were likely to be quite big. I wanted space for some music too. Hence, I bought an A-Data Turbo 4GB SD flash card via eBay. Unfortunately, the stock Palm ROM only supports FAT16, which tops out at 2GB. To go any larger, you need FAT32 support. To get that, you need the FAT32.PRC file, the ROMTool, plus step-by-step instructions. See also this TreoCentral web forum post. The ROMTool is a very safe way of changing your Palm ROM, but while I've used it (once), I can't offer support or answer questions about it. Read everything you can about it first, and direct your questions to the various web forums. Remember to delete the existing FATFS.PRC if you add FAT32.PRC! I had some initial reliability problems, but once I'd formatted the card using the built-in Card Info application, all problems went away. Formatting using Windows via a hardware card reader and Card Export did not resolve the problem. Late 2006 a few manufacturers released 8GB SDHC cards. Naturally, I wanted one! I'll want 16GB and 32GB cards when they come out too - too much storage is not enough! Thankfully, Palm released their Treo 680 with SDHC supprt and some smart folks extracted the driver files. When put into a Treo 650 (or 700p) it upgrades it with SDHC support. Again, I obtained my A-Data Super 8GB SHDC card from eBay. It cost me less than my 4GB, less than a year later! It worked straight off without any special formatting. See this mytreo.net forum thread for the required drivers and instructions. The only issue with larger than 4GB cards is the fact that 4GB is the limit for the 32-bit numbers commonly used to figure out free space. What that means is that the Palm will always report a free space less than 4GB. It won't be correct until your free space actually falls below 4GB. When your actual free space is just above 4GB, your Palm software may think it's almost empty and that may cause problems. Just put some more music files on it to nudge it over and you'll be right! Krusell Handit Platinum with Multidapt for PalmOne Treo 650. The important features for me were: protection of the screen (implying a front cover flap) and having the flap clip on the back where it won't get caught on things by accident. 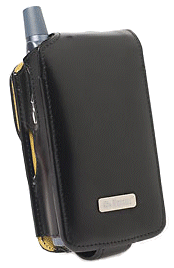 The front leather flap protects the screen, there is no plastic covering the screen so no usability problems. The keyboard does have a plastic cover, which makes it a little more tricky to use. Another important point is the availability of things like the Bikeholder and Wrist Strap that I might decide to get later. There's a bit of a story too. I ordered my case through Expansys Australia. The order took an age to be sent (supply problems), but my credit card wasn't charged until the order actually shipped. I was notified of the order shipping late one day, and the order arrived the following morning! Speedy! The bad news was that the Platinum case is supposed to come with two attachments for the case: a belt loop and a spring clip. There was no spring clip in the package. So I sent Expansys an email explaining the situation. I didn't get a reply until two days later (which was a little worrisome), but it was all good news - they'd shipped the spring clip. No questions, no hassles, just a simple - "it's on the way". So, while I didn't get a 100% perfect experience through Expansys, they resolved the problems quickly and with zero hassle, and that's worth writing about. I'll be a repeat customer. Good job Expansys! For those special occasions, such as when I go bush, I got myself an Otterbox 1920 case. An Otterbox is a weatherproof case that transforms the Treo into a rugged go-anywhere device. Perfect for keep dust and rain out, but still totally usable. As part of their promotion of the Treo 650 in Australia, Palm offered a free Bluetooth Headset, so that's what I have. It looks exactly like the Jabra BT330! I use my Treo with moving maps (via PathAway), my GPS receiver and my telescope. To achieve that I needed a serial port for my Treo. The obvious solution was a Bluetooth serial adapter. After investigating several models and being astonished at the excessive prices being charged, it was with considerable relief that as I was researching astronomy software, my selected package Astromist turned out to include a discount arrangement with Aircable. The prices of Aircables modules were already half that of the next cheapest serial interface I'd seen, the discount made them an even better deal. So far it's communicating with my GPS receiver, and I've constructed an adapter for my telescope. As it turns out, my GPS receiver doesn't work too well any more. It takes ages to get a lock, then loses it quickly, even with a clear view of the sky. I decided to buy a proper receiver. My choice: the Globalsat BT-338. The reasons were the small size, big replaceable battery (1700mAh, ~17hrs on time), and the super-sensitive SirfStar III chipset. I've had it in its leather case, in my pocket, inside my house with the nearest window about 3-4m away and still got a lock on to 8 of the 10 satellites that were available at the time! It came with a leather case that I punched three holes into - so that I could see the three LEDs while the receiver is inside it. The low battery warning is a bit disappointing. I took it out one day, no warning light when I started, but about 20 minutes later it was dead. So just like my Treo and my old netBook, I've got a second battery for it. SC-103PU - A web forum message educated me to the fact that the built-in Calc application now has a lot of useful features, including unit conversion, financial / statistical functions, trigonometry functions, and what I was really after: logic functions (hex / decimal / binary base conversions, bitwise AND / OR / XOR / NOT). SoundRec - I've found a way to grab the Palm Voice Memo application off a LifeDrive, and the necessary Palm Desktop bits to support syncing. I also grabbed Expense and Note Pad while I was at it. See my Forgotten Applications article. As mentioned above, I've installed the Palm Note Pad, Voice Memo, and Expense applications from the LiveDrive simulator. See my Forgotten Applications article for full details. If you've come here looking for instructions on updating Calendar to a version that shows the date/time of entries in the global find results, I've removed them. The latest Treo firmware fixes the problem (plus lots of others). Go to the Palm web site Treo support area and follow the instructions. More internal memory. The 64MB in the 680 is good, but more is always better. I don't like the smaller battery in the 680 anyway. USB 2.0 support. I've patched my Treo ROM for SDHC compliance and transferring gigabytes of data can take a while! GPS support, but only if a good high-sensitivity receiver was used. One of the benefits of an external bluetooth receiver is that it can be placed where it gets best reception, while the Palm can be placed for best usability. The two are not necessarily the same! If GPS support was built-in, it would have to be good enough to work well wherever the Palm ended up being placed for usability. Bluetooth 2.0. This means the Palm should have built-in support for stereo audio, headset, file transfer, and photo transfer. Third-party applications shouldn't be required for that sort of thing. Also, if my built-in GPS wish comes true, then it should be possible to set up the Palm to act as an external receiver for other devices, such as a digital camera. Wifi. While I don't have a particular need for it, I can see myself upgrading my LAN to wireless sometime, and being able to hook my handheld into that would be awesome. 1.2 megapixel camera. While some mobile phones these days are coming with up to 3 megapixel cameras, I don't see how the tiny optics in such devices can actually make use of that many megapixels. While I'd like to find some decent research, my feeling is that 1.2 megapixels (1280×1024) is the best you can get out of the small optics in mobile phones. Seriously, if you want nice hires photos, get a proper camera! Last updated: 2007-04-15. Copyright © 1999-2019.